Golden Knight Award (All 4’s): K-4: Peter Boronka, Olivia Hill, Landon Frank, Emma McCoy, Henry Perkins, Isabelle Ruhl, Ella Albert, Juliet Cramer, Austin Krabill, Evan McCoy, Isabella Smith, Reagan Welch, Briston McCombs, Kellan Walters, Sarah Ambrose, Gage Bowersmith, Brady Haines, Karter Payne, Natlalie Peterson, Nalia Sackman, Colton Sterrit, Macie Witherell, Kylie Baldwin, Logan Bishop, Destiny Castle, Jaxon Clark, Natori Clevenger, Riley Cooper, Michelle Harris, Lilly Kerce, Lane May, Anna Armrose, Saleen Miller, Ava Walters, Maleah Blevins, Ellie Brown, Delaney Carver, Ethan Hinton, Abigail Hinty, Max Keller, Makayla Mack, Tanner Miley, Kallie Wright, Mary Dean, Bryson Garris, Kody Lawhorn, Olivia Levering, Katy Repp, Camdyn Spencer, Carter Thomas, Johnna Tolley, Brady Yaussy, Madden Binnix, Steven Schiefer, Madelynn Smith, Lillian Thomas, Jaycie Carnell, Finn Fesler, Kathryn Naylor, Matthew Ruhl, Bobby Singh. All A’s Honor Roll: 5-6: Grant Bentley, Mia Fidler, Ryan Lehman, Jillian Mariotti, Megan Mills, Zoe Montague, Cole Cuffman, Maya Trainer, Madisen Hale, Parker Repp, Allison Sheriff, Hannah Kanagy, Brooklyn Kissling, Caiden Martinez, Emma Smith, Lizzie Erlsten, Isabel Crowder, Neveah Gallagher, Griffin Healea, Katie Holloway. 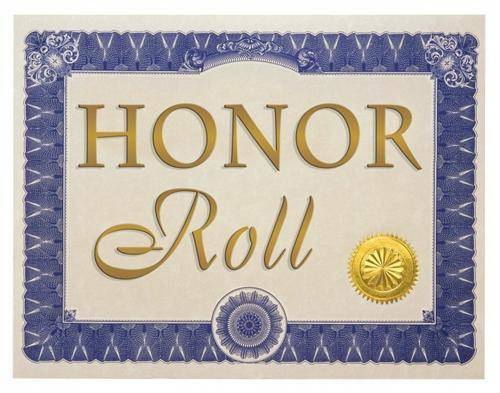 A/B Honor Roll: 5-6: Raelyn Fulk, Nathan Krabill, Sidney Wilcox, Whitnee Duncan, Bo Landin, Kaeson Ratcliff, Katie Statler, Brianne York, Maggie Brewer, Bayla Miller, Katie Dean, Alexa Gilliam, Vincent McKinney, Briez Abrams, Andrew Bower, Ella Creswell, William Naylor, Nicholas Armrose, Emily Ball, Alithea Holloway, Jaxson Wenger, Will Sears, Willow Faulkner, Cade Miracle, Alivia Blanton, Logan McCown, Alisah Williams. Merit Roll, 5-6: Ashlyn Calnek, Paul Cramer, Drew Hammond, John Huvler, Rael Ernsberger, Nathaniel Saunders, Patti Wenger, Ryan Diehl, Autumn Holmes, Chloey Keen, Aydan Reyes, A.J. Benarth, Lusey Cass, Kelbie McDonald, Grant Beard, Cowin Becker, Colten Peters, Reagan See, Aerionna Walker. 7th Grade All A’s: Jeremiah Adams, Lauren Johnson, Riley Johnson. 7th Grade A/B: Kylee Bilancini, Kazden Blevins, Madelyn Blunk, Nicholas Cavanaugh, Emilee Cook, Autumn Driscoll, Anna Erlsten, Isaiah Hallbrook, Wesley Hammond, Braelyn Ingles, Emilee Jordan, Sydney Kelley, Amanda Kincaid, Owen Philpot, Toby Pryor, Chance Stoney, Copper Thomas, McKenna VanDyke, Bohdi Workman, Emily Zeger, Madison Zeger. 8th Grade All A’s: Andrew Armrose, Canyon Dart, Timothy Diehl, Matthew Kearns, Jack Sears, Addison Stevens-Scroggins, Reagan Swihart, Maggie Tuttle, Griffin Workman. 8th Grade A/B: Dylan Amens, Jonathan Artrip, Kahlan Ball, Kaytlyn Barney, Ethan Branch, Kristy Brown, Graesin Cass, Haley Dille, Rachael Ervin, Bryce Hale, Logan Mariotti, Katherine Marquis, Britney Maynard, Corbin Potts, Trenton Ramos, Emma Roose, Faith Taylor, Noah Vanderkooi, Autumn Webb, Jordan Welch, Alexis Wenger, Gavin Whited, Maddison Yaussy, Riley Yunker. 9th Grade All A’s: Austin Hammond. 9th Grade A/B: Megan Adkins, Jesse Blasberg, Natalie Bloom, Kaitlyn Blunk, Tyler Boggs, Olivia Bower, Colleen Brocwell, Joycieanna Cooper, Abigail Donner, Emilie Drumm, Kylee Fout, Julia Kanagy, Luke Montague, Zoe Parrott, Gage Presley, Olivia Schnuerer, Michael Stuff, Kristie Wright. 10th Grade All A’s: Austin Amens, Juliana DiTullio Jessica Duryea, Madelynn Jordan, Sabrina Kelley, Wyatt Reeder. 10th Grade A/B: Conor Becker, Briana Bennett, Francesca Cutrupi, Elijah Davis, Alexis Emrich, Brandon French, Jordan Haines, Zachary Harriger, Cassady Healea, Brooke Huntsman, Madison Huntsman, Cheridan Jones, Jaden Kachermeyer, Joshua Langoehr, Hunter Mariotti, Carolyn McGauley, Macy Miracle, Adam Petulla, Brandon Planey, Gavin Ramos, Alexis Satorius, Ethan Trainer, Alexander Tuttle, Sam Weaver, Kaylee Wertz, Sam Young, Michalea Zeger. 11th Grade All A’s: Sierra Arthur, Hailey Barnhart, Aaron Berg, Brody Bishop, Alyson Blunk, Christopher Bood, Anna Donner, Mostyn Evans, Adalyn Farley, Chase Hoover, Elizabeth Mayton, Hunter Mills, Anthony Petulla, Isabelle Szulewski, Lillian Tate, Ryland Thomas, Brent White. 11th Grade A/B: Kalob Barney, Hanna Bentley, Jesse Cline, Ciara Everly, Kamryn Engles, Sarah Lewis, Alec Moore, Zane Parrott, Lexie Stoney, Paul Trouten, Carolina Walker, Bailey Wiseman, Andrew Zoll. 12th Grade All A’s: Brooke Bennett, Cristianna Boggs, Rebecca Duckworth, Kelsie Fike, Samantha Grogg, Manny Heilman, Adria Houghtby, Tyler Kegley, Hope Miracle, Melia Stackhouse, Caitlin Thebeault, Austin Wheeler. 12th Grade A/B: Kyle Ditty, Sara Drumm, Sarah Dudley, Jade Etue, Brandi Heston, Haylee Humphrey, Alison Ivy, Emily Mangette, Casey Marteney, Chloe Meier-Wenger, Emma Naylor, Noah Trainer, Jordyn Zoll.